Ian’s Art Direction: Did you see the cover that came back from the artist? It’s full of crotches! Crotches! I’ll be damned if I’m going to pay that idiot to fix it. See if you can get an intern in here to cover them up with oblong stickers or smudges or something. Make it look natural. “I’m sho shorry…Mein Fueh-*hic* -rer! Is this a heartfelt representation of beer goggles? Makes you wonder what the cover would look like if the drunkard was a woman. 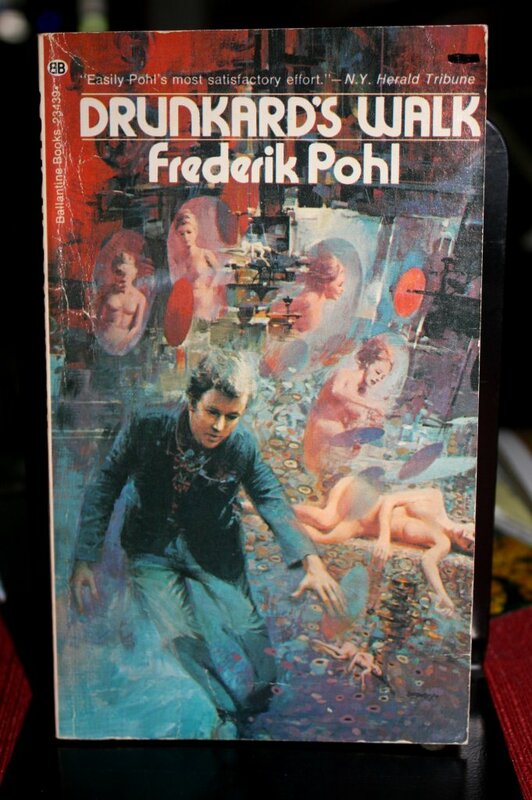 “Easily Pohl’s most satisfactory effort.” Ouch. @maxbenign – you’re right. That’s not the best of choice to put on there. When I walk home drunk I don’t see naked women. Are you supposed to see naked women? Sometimes I get home and I want there to be a naked women. But mostly I get a slap around the face and, “How dare you stay out this late!” from the talking unicorn that gets into my house. There are sheep bursting forth from those naked women. Sheep. Someone has some really strange sexual fantasies. I kind of like John Berkey’s cover… I dunno kind of encapsulate what it’s like to walk while drunk…. SO yeah, I echo the “heartfelt representation of beer goggle” statement. The pull quote sounds like something your professor marks on your paper, not a blurb for a novel! Its like a critique issued by an English teacher, ‘satisfactory’. I dont drink so I never see any naked women. Hey wait a minute….. 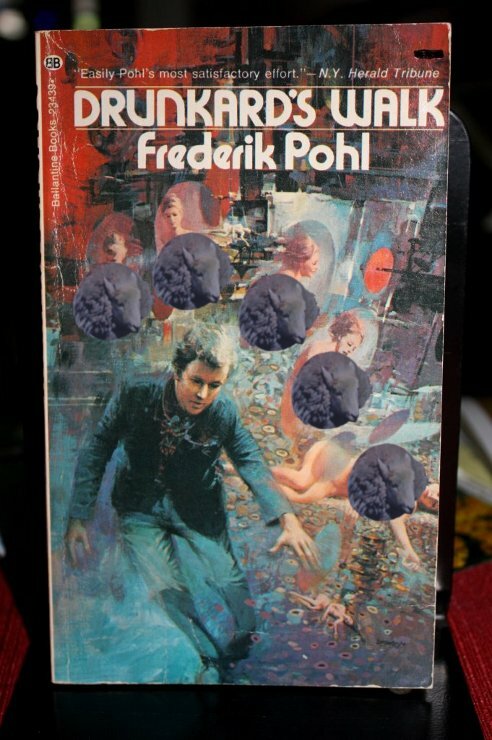 The first edition cover is better. I think the Admins need to develop a smaller sheep for the smaller naked women in books. The nudes all look like standard art school model poses. I have a closetful of paintings just like them. It’s like an art student stumbling past a row of class exercises leaned against a paint-spattered wall while he reaches for one of those little manikin posing figures. Clearly the artist is having a flashback to art school. @ Dead Stuff with Big Teeth. Thank you, thank you! I needed that tonight! My books aren’t exactly selling like hotcakes so I took on a night job cleaning medical offices. (Oh boy, oh joy, where do we go from here?) Anyway, laughs are few and far between. Narf! Starting from the lower right, the second young lady appears to still have a crotch. But of the other sort. Chap looks like young Paul Simon stole Shat’s toupee.